Tetra Pak and Global Footprint Network poll reveals that sharing information about resource scarcity impacts consumer behaviors. Although resou rce constraints are not a top-of-mind issue for American consumers, attitudes, actions and perceptions shift when knowledge and information about resource scarcity is shared, according to a survey from Tetra Pak Inc. undertaken with Global Footprint Network and published today. The findings come as the world marks Earth Overshoot Day, the day humanity has used up nature’s budget for the entire year. Humanity’s demand on the planet has moved Earth Overshoot Day from early October in 2000 to August 13this year. Carbon sequestration makes up more than half of that demand, according to Global Footprint Network. Only 41 percent of respondents reported being very aware of the issue of resource constraints in the survey of 1,000 U.S. consumers by Tetra Pak and Global Footprint nNetwork. However, an overwhelming number of respondents (86 percent) said that if they knew that using renewable packaging helped reduce carbon emissions and slow climate change, it would impact their choice of packaging. 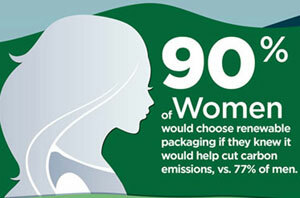 This was particularly the case with women—90 percent of women would choose renewable packaging if they knew it would help cut carbon emissions vs. 77 percent of men. “With the heightened focus on climate change ahead of the U.N. Climate Conference in Paris in December, it is important not to overlook the role that renewable materials and renewable packaging can play in keeping the climate in balance,” said Elisabeth Comere, Director, Environment & Government Affairs, Tetra Pak Inc., USA. “Our survey confirms our belief that with information and education, consumers will respond favorably to the need to pay closer attention to resource challenges and change their individual actions, including making more environmentally responsible decisions around packaging,” Commere added. The survey also explored specific actions respondents would be willing to do to conserve natural resources, such as pay more for water and restrict use, or search for clean, renewable energy alternatives. The top three actions that respondents said they would be willing to take were seeking out food or beverages that came in renewable packaging. buying locally grown food as much as possible, and buying only the food that a household was going to consume and consuming all the food bought. Overwhelmingly, respondents (81 percent) said that no one group (individuals, industry, government) is especially responsible for addressing natural resource constraints. They also support the need to do more—from changing their own behaviors to recognizing the need for companies to consider all facets of the lifecycle of products and packaging.